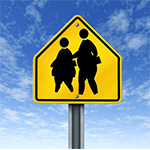 MONDAY, July 7, 2014 (HealthDay News) -- Obese people, particularly those with excess belly fat, may face a higher risk of developing chronic obstructive pulmonary disease (COPD), a new study suggests. The researchers report that women with a waist size of roughly 43 inches or more and men with waist size of 46 inches or more showed a 72 percent increased risk of developing the lung disease, compared with people who had a normal waist size. COPD, also known as emphysema and chronic bronchitis, is the third leading cause of death in the United States, according to the American Lung Association. "It is already known that COPD may be prevented by avoiding exposure to tobacco smoke, air pollution and occupational dust damaging the lungs," said lead researcher Gundula Behrens, from the department of epidemiology and preventive medicine at the University of Regensburg in Germany. "But maintaining a normal waist circumference and recommended levels of physical activity may also decrease the risk of COPD," Behrens said. According to recommendations of the World Health Organization, waist circumference should not exceed 35 inches in women and 40 inches in men. The investigators also found that people who were physically active five times or more per week had a 29 percent decreased risk of COPD, compared with people who were physically inactive. The American College of Sports Medicine recommends 30 minutes to 60 minutes of moderate-intensity physical activity at least five times per week or 20 minutes to 60 minutes of vigorous exercise at least three days per week, Behrens noted. For the study, published July 7 in CMAJ (Canadian Medical Association Journal), Behrens and colleagues collected data on more than 113,000 Americans, aged 50 to 70, who did not have COPD, cancer or heart disease at the beginning of the study in 1995. Over 10 years of follow-up, over 3,600 people developed COPD. Waist size was a strong predictor of COPD risk whether the individual was a smoker or had never smoked, the study authors noted. However, Dr. Norman Edelman, senior medical consultant to the American Lung Association, noted that the findings are far from conclusive. "At this point, I think it's possible that it's just an association without a causal effect," he said. "The link between the association is that both COPD and obesity cause shortness of breath." But Edelman noted that for someone who is obese and smokes, smoking is the primary culprit. "Smoking overrides everything -- smoking is still the major risk factor for COPD," he said. On the other end of the scale, underweight people had a 56 percent increased risk of COPD, the study authors found. This might be the result of malnutrition and reduced muscle mass or inflammation that reduces the ability of the lungs to heal themselves, Behrens said.